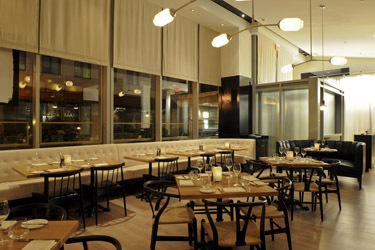 Much of what makes one of Boston's newest restaurants, Artisan Bistro, appealing is its ability to please Boston locals, the stream of visitors taking in the sites Downtown or performances in the Theater District and business executives from the Financial District meeting for lunch or dinner. Artisan Bistro is a modern American bistro where guests can mingle after work and post-theater over cocktails while enjoying approachable artisanal cooking. As for the food, it's aimed squarely at offering fresh local and seasonal dishes using native ingredients as well as uniquely sourced products with subtle bistro influences. The cocktail program includes local favorites, numerous microbrews and a signature Bloody Mary menu. The mood at the bar, like the restaurant itself, is lively and inviting, yet relaxed and casual at the same time. Hungry Yet? Click to View the Menu. Home | Restaurants | Catering | Events & Insider Info | About Us | Press | Contact Us © 2008 Where To Eat. All Rights Reserved.